For people that are remodeling their bathroom, finding the right bathroom faucet for their needs may be one of the most difficult parts of the remodeling process. There are literally thousands of different styles available to choose from and many people are torn between choosing the faucet fixtures that they like first or matching the faucet to a sink that they have chosen. American Standard faucets are some of the most highly regarded faucets in the industry and there are so many different styles available that people should have no difficultly finding the one that suits their needs. Each of the different styles of American Standard faucet comes with the Speed Connect Drain. This drain can be installed in one-third of the time using one-third of the parts that come with a standard drain. These drains are especially welcomed by the do-it-yourself crowds because of the ease of installation. 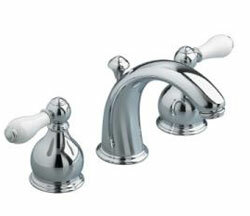 The American Standard faucet can be purchased in a wide variety of finishes. All of the finishes available are long lasting and require little maintenance to keep them looking as good as new. There is also a specialty finish, called the Everclean Faucet Finish, available that is guaranteed to give you a spotless faucet with one wipe. The design of the handles on each of these faucets varies as well. The handles come in a number of different styles, such as the traditional cross handles and the more contemporary single lever style. Several sizes are also available, making it easier for people that have smaller fingers or limited mobility to find a faucet that is easy for them to use. There are several things that you must keep in mind if you are purchasing an American Standard faucet to go with a sink that you already own. Make sure that you don't purchase a small faucet to go onto a huge sink or a large faucet to go onto a tiny sink. The best judge is to purchase a faucet that directs the water into the center of the sink and matches the hole drillings in the sink for attachment. For people that have special needs, there are speciality American Standard faucet styles available as well. For example, families with small children may want to purchase the Hot Limit Safety Stops that offer adjustable settings to limit how far the handle can be pushed towards hot. The safety and other specialtiy features available on an American Standard faucets have helped make the brand one of the most popular in the nation.